France and Germany have so far spoken out against the bill as it affects European industries while advancing US commercial interests. "At the moment, there is no unity on the issue of anti-Russian sanctions between the EU and the US," Hickel said. "Having made this decision on the introduction of anti-Russian sanctions, the US House of Representatives made a mistake. This decision is motivated by internal political factors. This is a provocation directed against Trump," he continued. According to Hickel, the new sanctions once again demonstrate the US is striving for global dominance. The expert noted that there was "no immediate reason to impose these sanctions now" as the investigation into alleged hacker attacks and interference in the US presidential election is still underway. "In this case, these sanctions are rather counterproductive," the expert stated. "They are a projection of the US' global imperialist ambitions." Earlier, a source in Brussels told Sputnik about the EU's possible response to the new anti-Russian sanctions introduced by the United States. In particular, the source said that the European Union might limit US companies' access to loans from European banks if the United States imposes new sanctions against Russia. However, political analyst Alexei Mukhin believes that such "activity" by the Europeans is unlikely to be followed up by any concrete steps. According to the expert, the European Union wants to "make the United States nervous." In his opinion, European officials won't rush to take any measures against the US. "This European Union activity with respect to US companies is still a provisional one. Apparently, the European Union decided to make its American partners nervous," Mukhin told Sputnik. "On the one hand, of course, they can try to scare the US, but it is clear that some serious countermeasures on Washington's side will follow. 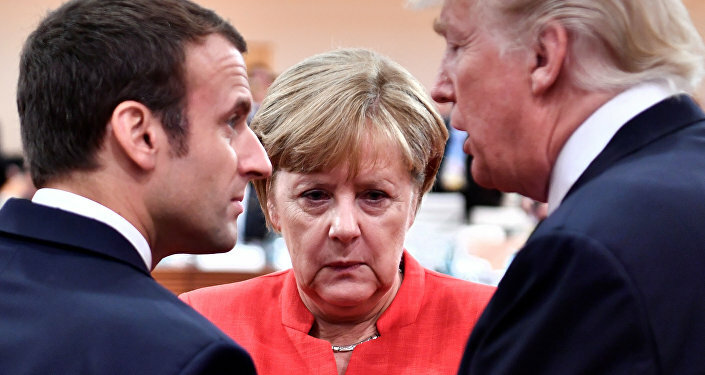 And in this connection, I think, European officials will be very careful in their attempts to organize some kind of countermeasures. On the other hand, those sanctions that the US has proposed against Russia, Iran and the DPRK are seriously violating the economic sovereignty of European companies, and may have very serious consequences. Therefore, everything will depend on the will of European officials in the future. Now they just, let's say, showing their teeth," the analyst concluded. Earlier, European Commission President Jean-Claude Juncker stated that the EU was ready to ‘act appropriately' to US sanctions against Russia in the event that they target EU interests. In her turn, German Minister of Economy Brigitte Zypries even warned against a possible trade war between the EU and the US. According to the minister, the United States was not trying to intentionally wrong Europe, but they fell out of step with Europe on the issue of sanctions. Zypries said that there was a possibility of retaliatory measures from the European Union and warned against engaging in a serious economic conflict.